You are f*cking perfect, trust me. If you believe you’re not than who told you that you weren’t? Can you remember who it was? Or is it just a belief you have told yourself? Was it your parents, grandparents, family, teachers, friends, society and… what did they tell you? Why do you think they said what they said? Do those stories serve you or are they pushing you closer to who you are created to be? None of the stories, beliefs or ideas of others can control who you are intended to be. Problem is there are 7.53 billion people in this world and that is 7.53 billion different views on what life should be, it’s their perspective, their belief, their reality, not yours. Ready to walk in your perfection, the life you want. The way to release that perfection into your full potential, purpose and passion ask yourself where the block or the stories came from so you can unleash the inner power you have. Their perceptions are their truths, that WE have gathered and believed throughout our lives, yet they are not ours. Listening to those stories make us lose touch of who we truly are. Right now, we are all in search of that lost, hidden individual inside of us that WANTS to share their purpose. Sometimes we spend a lifetime searching everywhere in religion, money, people, children, drugs, food, etc. but most of these things are outside of us. What we are looking for is the meaning and purpose of why we exist. Are you really perfect? Well I’d like to think I am perfect. Especially since I came from so much cover up of who I was because of other’s fears about what they read about me. I found out that I am imperfectly perfect, a stone eager to be chiseled into form, a clay begging to be molded. Some may say that you can’t ever reach perfectionism. There is always room for improvement. True! Yes, we can improve at what and who we were created to be and do. My problem began when my mother and father told me growing up that I always did a “good job” and that I could do anything I wanted to do when I grew up. My teachers would say mostly the same thing too! I believed I was good, I was great, especially in sports. However, their perception of how I got to good or great was different. What do I mean by different? Well my parents never pushed college. My dad said that when I finished high school, I could go to UW. I asked him what that was and he replied with a smirk on his face, “The University of Work!” I laughed and accepted what he said, because I didn’t really know any better. Hell, I took the test to get into college and they told me that I’d have to take so many refreshers before I could even start college courses. I told myself like hell I’m going to continue taking classes that I already did and this time I would have to pay for them. So, I made up my mind that UW was my only option. Teachers never really pushed college where I was from, though they did push their personal beliefs or another person’s perspective. It might have been because I was classified as LD, Learning Disabled, and was in the special education classes where they didn’t think I would amount to much. However, they would fill my head with how good I was doing in school and on the baseball field. Even though I remember my mother having to fight the school to give me a high school diploma. So how good was I really? These perspectives were nothing more than a theory or their interpretation of the truth. Think about it how many World History and American history books have been written? How many author’s perspectives or versions of the truth can there be about one event? There was one class that I always enjoyed over any other and that was art, where I was were free to be me. The other classes taught us to do things in a certain way. If you didn’t do it that way you were punished with your grades. In art, you were given instructions on what project you were to work on over a few weeks, the teacher would give you strategies and tools on what it could take to complete your project. In the end, the method, the work was done by the interpreter, the student. The grade was on the strategies, effort and attitude you put into the project. They didn’t grade you on realism, or if it looked like the model we were trying to duplicate. We are not machines and we are all gifted at how we see things and how we interpret experiences and things. There is an exercise I enjoyed that we would do in art class. We would take one or two models and create a circle around them. The teacher would give us 5-10 minutes to draw our models, sometimes less time. The exercise was fun and it broke us away from trying to be perfect and just draw what we saw. Would we draw what was actually there? Well yes and no! Yes, it was what I SAW. No, it might not be what YOU SAW. That’s the beauty of art and it demonstrates our different views of how we see things. There is a movie “Rapid Fire,” where the lead character is in art class and he was instructed to draw a model. When the class ended the instructor looked at his drawing and questioned him by saying, “Why can’t you draw what you see?” The lead character Brandon Lee said, “I did draw what I saw!” The viewer then sees what he actually drew and it was the model and behind her, we see a dragon. When it comes to art this is where we are free to express ourselves. Our lives are an art, a piece of history and precious. If we are judged we remember it’s OUR work, OUR design, OUR process. There will always be critics and people that don’t like what we do. It is up to us to SEE what we want to SEE and until we SEE what we WANT, we need to BELIEVE it until we SEE it. 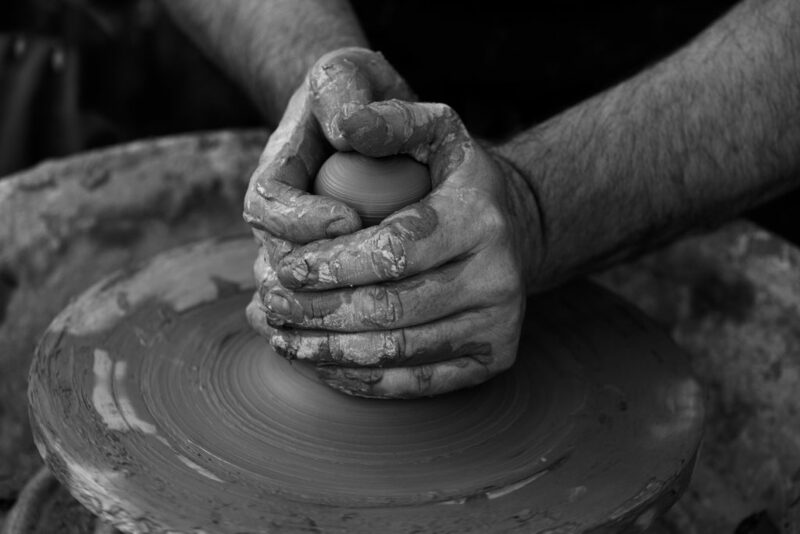 You are f*cking perfect, you are the clay AND the potter. You decide what you see and you fulfill its role. You don’t like what you see, I challenge you to go within and find the WAY, the tool and the feelings that you need to be the perfect version of yourself. Don’t just want to get through your life’s challenges, SEE what you need to learn and appreciate through it. Remind yourself of what you want, and find the power within to write and paint your reality with YOUR beauty, YOUR touch and YOUR art! -Casey McBride is the co-founder of McBride SOMOS where he is a step family expert and Latinas Finas where he supports his wife to EMPOWER, COLLABORATE and MENTOR this and the next generation of women. He is known as the QUIET POWER Superhero of the Team because his intentions are for anyone who has been labeled to find, identify and reIGNITE their own sense of worth and identity. Want A Bandaid or To Uncover Your Purpose?